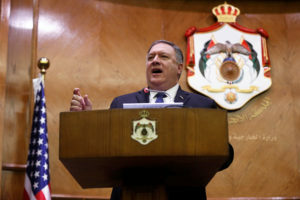 AMMAN, Jordan — The Trump administration is doubling down on commercial and diplomatic efforts in the coming weeks to “put real pressure on Iran,” U.S. Secretary of State Mike Pompeo said at the start of a Mideast tour Tuesday. The trip comes amid confusion over conflicting statements by President Donald Trump and senior U.S. officials about a planned U.S. troop withdrawal from Syria. Trump made the surprise announcement about a withdrawal last month, saying some 2,000 troops fighting alongside Syrian Kurdish allies in northeastern Syria against Islamic State extremists would be pulled out soon. He did not give details, such as a timetable, leaving bewildered U.S. partners in the region jockeying for influence over terms of a withdrawal. Pompeo contended Tuesday that the planned withdrawal from Syria would not complicate the administration’s anti-Iran campaign. He said U.S. allies in the region, including Jordan, agree on what they view as the “enormous risk” Iran poses for the region. Pompeo’s visit began as U.S. National Security Adviser John Bolton was set to depart Turkey without meeting with President Recep Tayyip Erdogan — an apparent snub over disagreements about the Kurdish fighters in Syria. U.S. officials had said the two were expected to have consultations on Tuesday about the fate of Kurds allied with the U.S. in Syria as part of discussions about Trump’s troop draw-down. The Trump administration in November restored U.S. sanctions on Iran that had been lifted under the landmark 2015 nuclear deal with Western powers. The sanctions cover Iran’s shipping, financial and energy sectors. They are the second batch the administration has re-imposed since Trump withdrew from the accord in May. Later on Tuesday, Pompeo met with Jordan’s King Abdullah II at the royal palace in the capital of Amman. During a brief photo opportunity, Pompeo was chatting with the monarch, mentioning a speech by President Trump, to be delivered from the Oval Office later Tuesday.